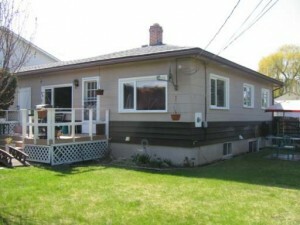 Great Brock bungalow with 2 spacious bedrooms on the main floor and a large two bedroom inlaw suite downstairs. The main floor has a large kitchen, spacious mud room/laundry room and living room. Recent updates include HW tank (6 months), Roof (last 5 years), paint and flooring. There are two parking areas to accommodate all residents and RV parking as well. Fully fenced private yard. Steps from the elementary school, secondary school and transportation. Very close to McArthur Island recreation and shopping. Minimum 24 hours notice for all showings. Tenanted up and down, upstairs tenants pay $1050/month and basement $925/month including utilities.